I've been meaning to write this post for absolutely ages but it always got put on the back burner in favour of newer things I've gotten. Recently I came across Mora Pandora. 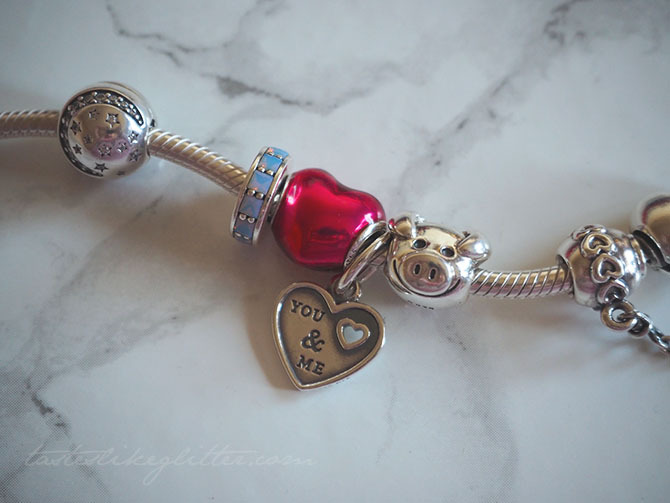 Ellie runs a fabulous Pandora blog, posting about new releases and previews, alongside reviews on charms. Since following her I've been getting more into collection releases. Valentine's was the first collection that I could get into as by the time I started following them, the Christmas collection had already been released. Of course being that it's Valentine's it was full of hearts and pinks, which isn't something I usually go for but seeing it in person definitely helped changed my mind. This was the one that stood out to me most in the preview images but I wanted to see it in person before purchasing. I'm glad I did as on the website it looks quite dull and could possibly be overlooked. 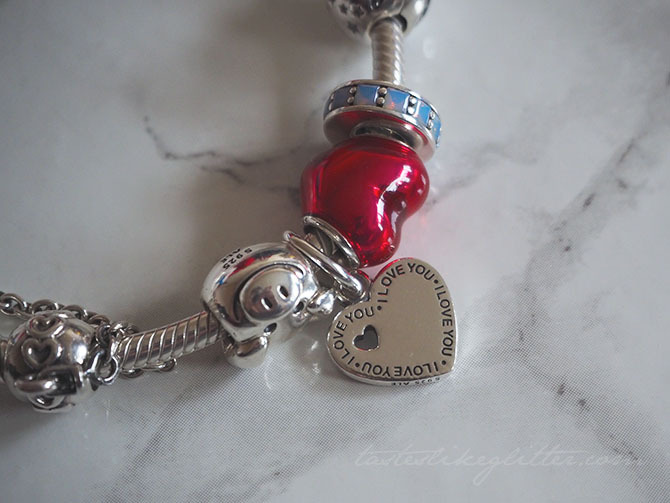 The charm itself is a silver heart overlaid with a pinky red enamel, giving it a jelly like finish. In some lights it looks more red than pink and vice versus. What drew me to this charm was the unique finish as I don't believe they have done something like this before. This year was the first time I'd had a proper Valentine's (yep, I'm that sad!) and I was lucky enough to have this gifted to me. Aside from a single rose, this was my favourite as I get to wear it everyday. This charm is one of the few that isn't threaded as it's classed as a pendant charm. The front has an oxidised finished with a cut out heart. The back could have been left plain but instead it has a polished finished with 'I love you' engraved around the edges. Which I think is a really lovely touch. Halsey x M.A.C Future Foward. Nivea Pearl & Beauty Roll On. Lush Key Lime Pie Lip Balm.